Who's ready for the 8th and final instalment of Game of Thrones? 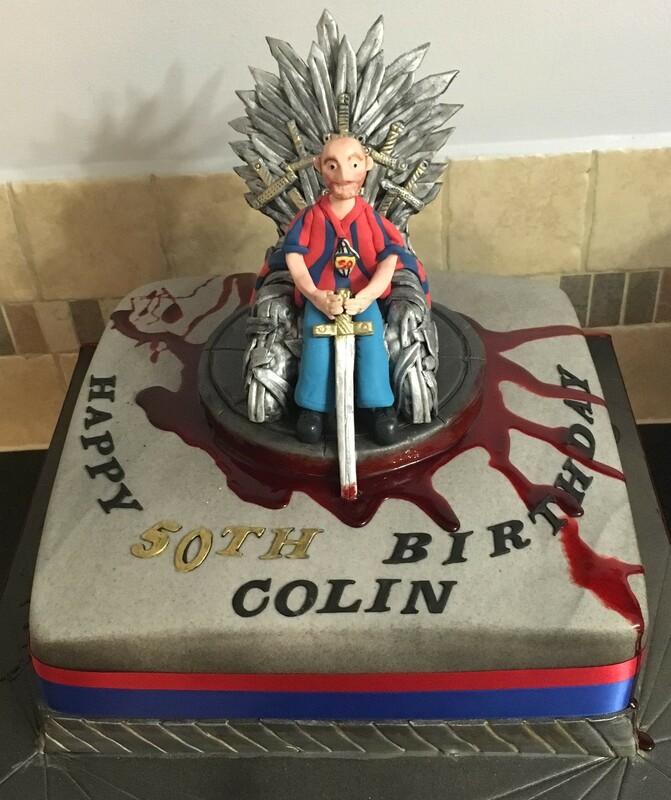 We went out to the lovely members of CakeFlix and asked them to send us some of their best Game of Thrones cakes ahead of the new season! As always, they didn't disappoint! Not a fan of the show but want to have some of your other work on display on our site? Enter our Cake of the Month competition for a chance to have your cake featured as well as win incredible prizes from Karen Davies and The Cake Decorating Company! 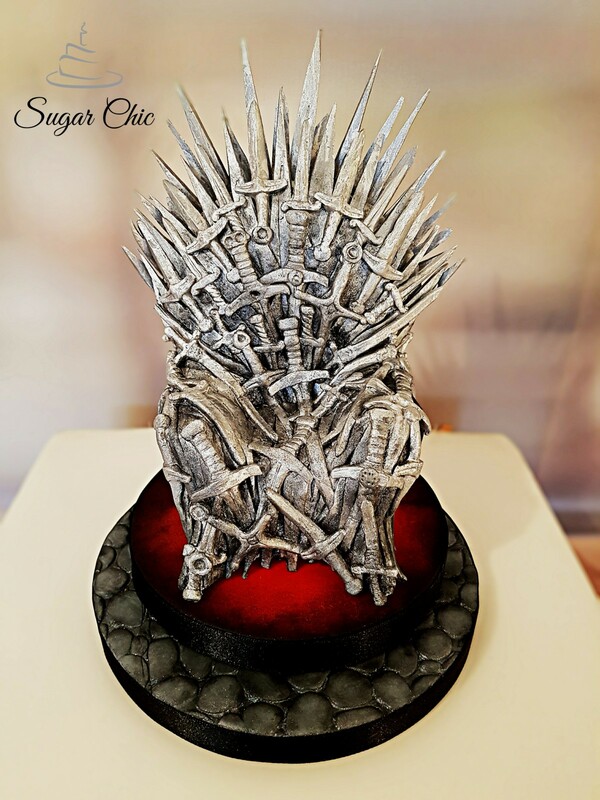 CakeFlix member, Kristine AKA Sugar Chic, made this incredibly intricate Iron Throne last year. With over 100 moulded swords and knives, plus another 50 or so hand cut blades. 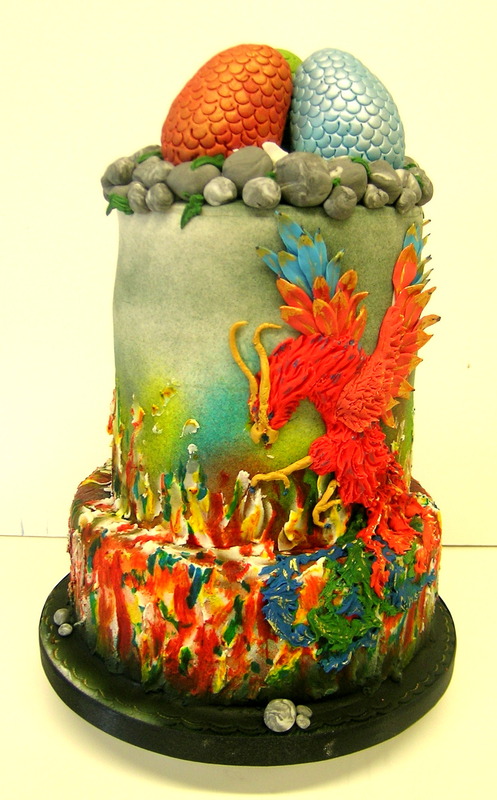 This cake took around 8 hours from start to finish and is made using Laped Modelling Paste and painted with Rainbow dusts. Graham Weare created this fiery design based on the show. We think you'll agree that the colours are simply mesmerising on this one! 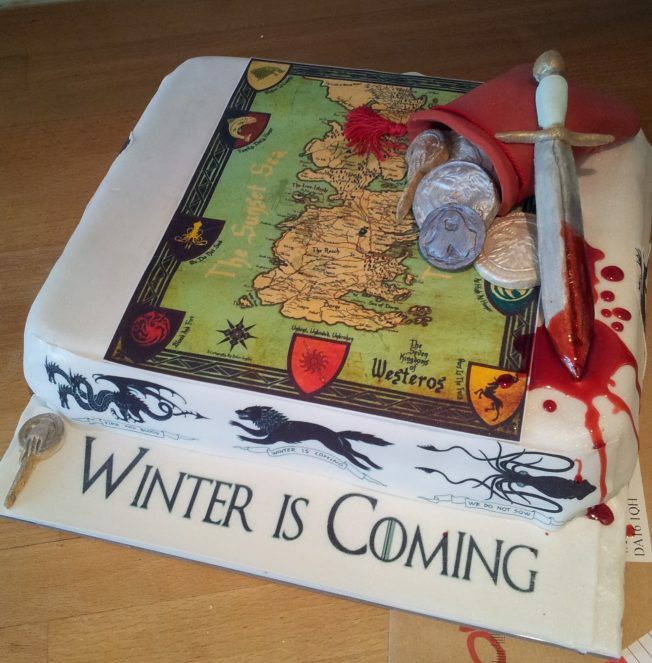 Helen Swan made this edible map of the wild world of Westeros. Everything on this cake was hand made from icing apart from the map which was printed. Helen made copies of the house sigils into coins, a red medieval style purse and a bloody dagger to mimic the dramatic Red Wedding!! 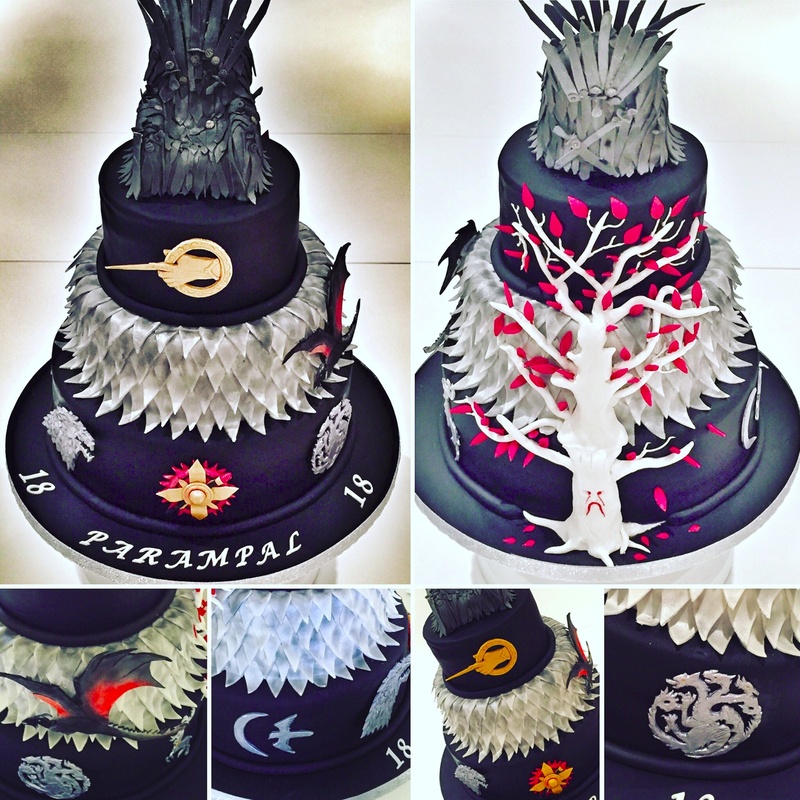 Danette Kessler of Danette's Creative Corner created this wonderful 5-tier cake of the Game of Thrones heart tree. 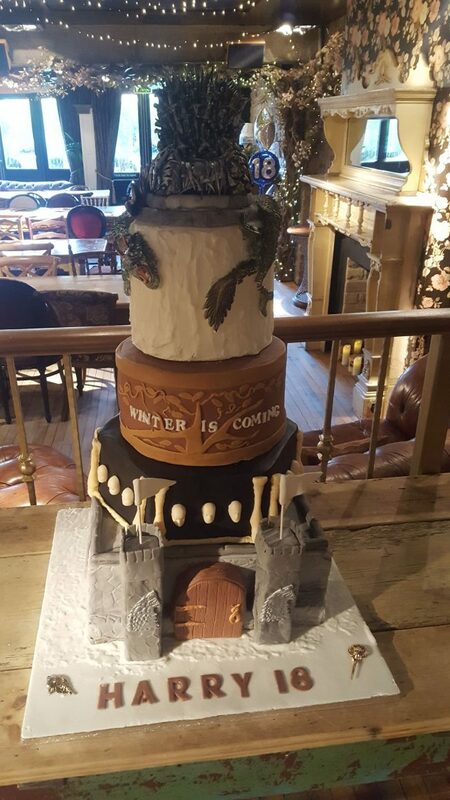 Complete with Iron Throne on top, winter is definitely here! You can try some of Danette's cakes out for yourself using her CakeFlix tutorials! 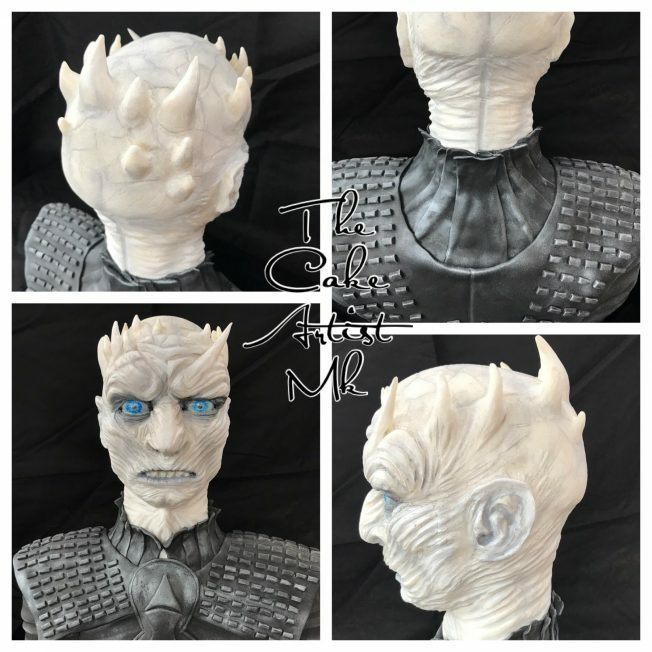 Ruth Wallace certainly brought the haunting Night King to life with this fantastic cake sculpture. His icy glare is nearly as cool as the cake its self! From the terrifying Night King to something a little cuter. 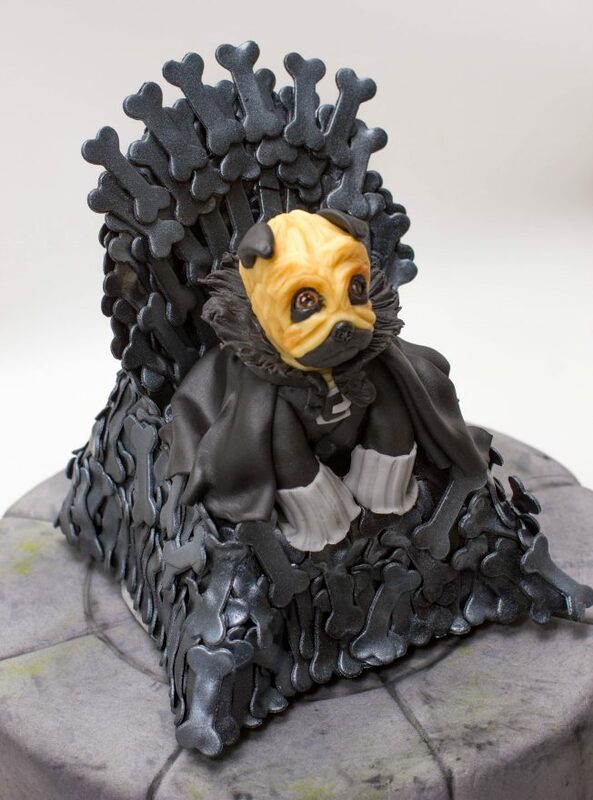 Julie Rogerson from Julies Cake in a Box made this adorable pug who has woofed his way to victory in Westeros. Mandy Suckling made this Game of Thrones birthday cake featuring both throne and dragon. The metallic paint finish on this one really brings the cake to life along with the fantastic chain link effect! 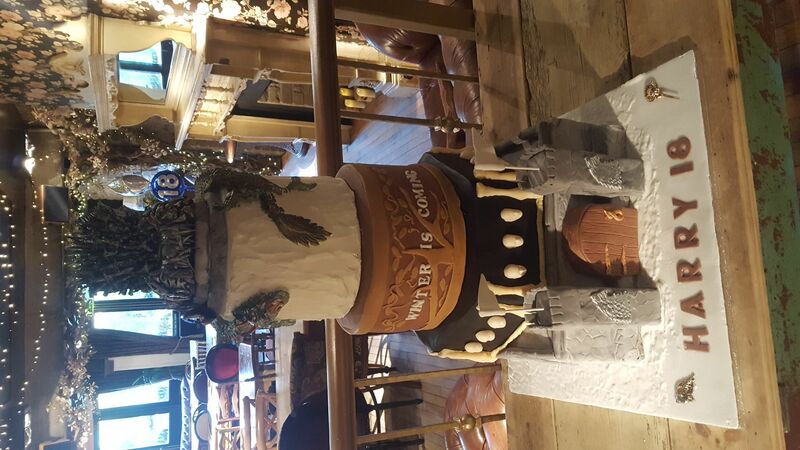 Hardip Pabla of Perfect Lovely Cakes made this intricately designed Game of Thrones cake, despite admitting that she knows nothing about the show! Hardip says of the cake "It is a cake maker's dream to get to work on something they know nothing about. Stress levels aside, the resulting feeling when you nail it for the client is amazing." The badges on the cake were hand cut and Hardip added that "clients and their passion is what celebration cakes should be about" and we couldn't agree more! Fran & Malc's Wedding at Moor Park Golf Club followed by Tipi reception at Berkhamsted Cricket Club. 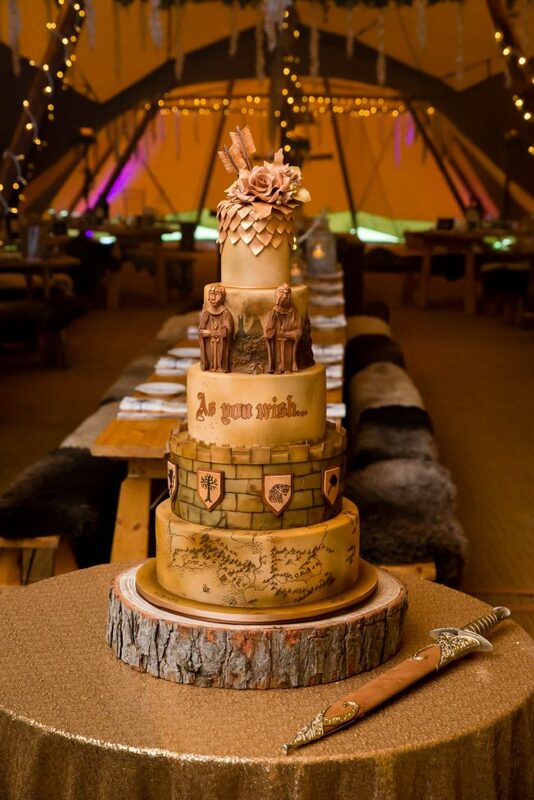 CakeFlix tutor Natalie Porter made this stunning Game of Thrones-themed cake for a lucky couple on their wedding day! 5-tiers tall and complete with Natalie's famous sugar flowers, we just hope it didn't turn into a red wedding with people fighting for the last piece of cake. 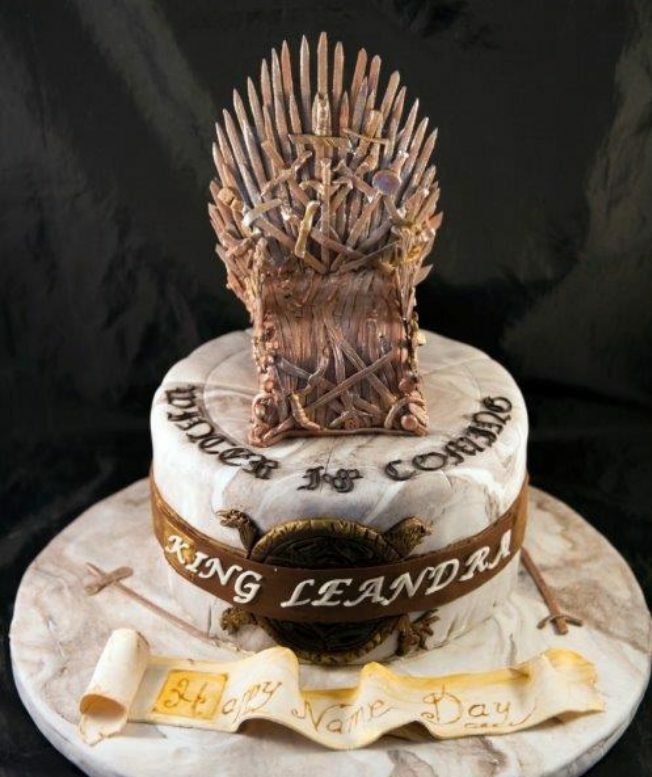 Marilyn from Unique Cakes made this Happy Birthday cake (or should we say Happy Name Day cake?) for a lucky King. We're sure they had a sweet birthday getting tucked into this one! 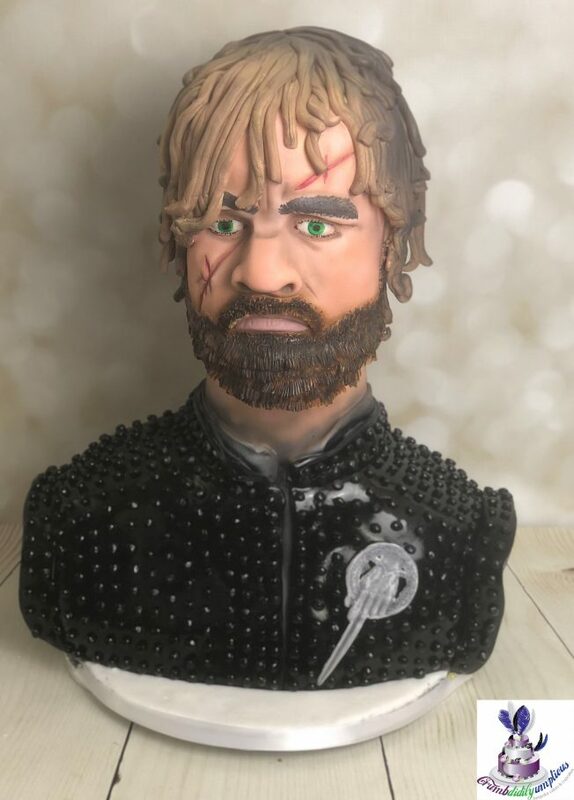 Kerrie at crumdiddilyumptiouscakes made this sublime cake sculpture of Tyrion Lannister. Somehow Kerrie managed to get the cake done in just 3 days. We're surprised as the cake looks bigger than Tyrion himself! Lynne Ward incorporated a whole bunch of diffeen Game of Throne themes for this skyscraper of a cake. We can only hope that 'Harry' manages to get down to the 'hall of faces' by the time he hits 30. 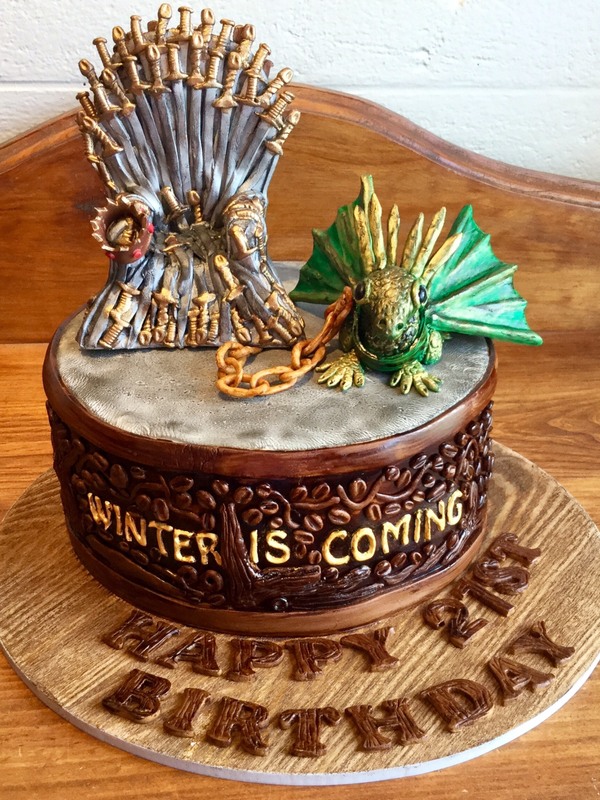 Want to see more Game of Thrones cakes? Check out our 5 Cakes Worthy of Westeros! 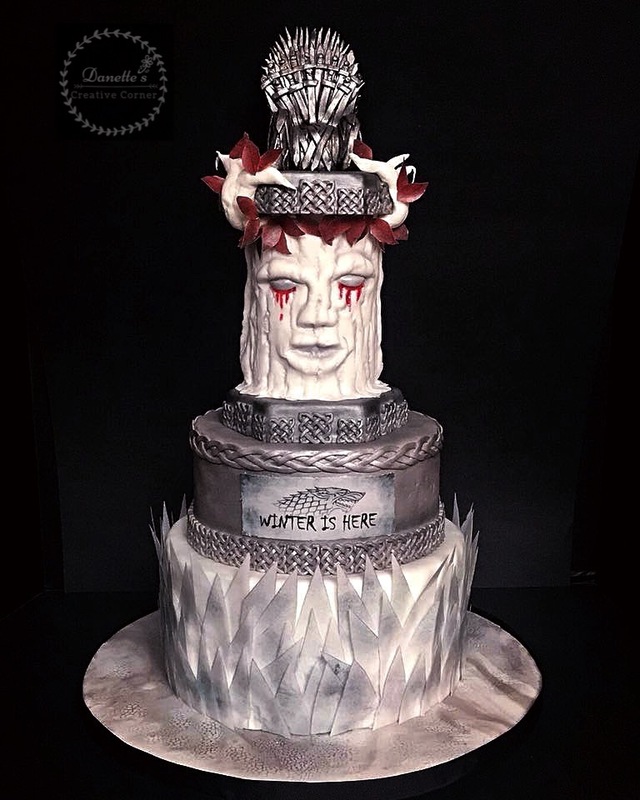 What is your favourite Game of Thrones cake? Let us know in the comments below !